The White House offers a noteworthy example of construction techniques employed by Irish settlers to the province. 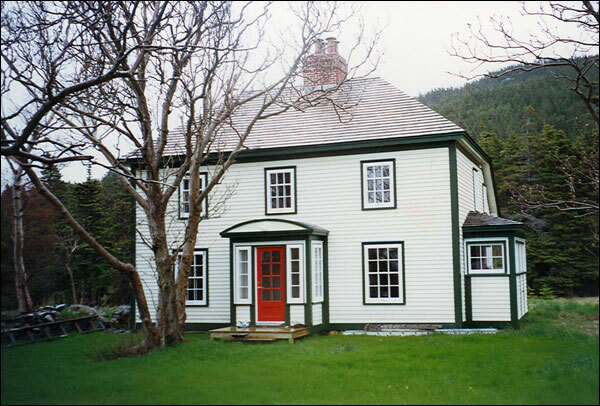 Of particular note is the large open fireplace or inglenook contained within the structure, a very rare example of Irish vernacular construction in Newfoundland. The fireplace is most likely made of locally quarried stone and consists of three stone walls and a flagstone floor. Two benches, seating up to ten people, are arranged on the projecting walls. The White House is a very rare example of Irish vernacular construction in the region. Built sometime in the early 19th century, the house is one of the older intact structures in the region. Using the construction techniques of earlier Irish settlers to Newfoundland and Labrador, it may have been built for the immigrant family of Michael White of County Wexford, Ireland. The house evokes a sense of time and place. Aside from the obvious functions of cooking and heating, large open fireplaces like that in the White House were places where social activities occurred and cultural values were disseminated. As wood and oil stoves were introduced to rural areas, inglenooks became less common but kitchens continued to be centres of socialization and enculturation. The White House was designated a Registered Heritage Structure by the Heritage Foundation of Newfoundland and Labrador in October 1992. Also view the White House Registered Heritage Structure on the Heritage Foundation of Newfoundland and Labrador web site. The Newfoundland and Labrador Heritage Web Site has on its site only a portion of the registered heritage structures in Newfoundland and Labrador. To view a complete list or search for a particular structure visit the Heritage Foundation's Property Search page.